In Through the Ages, you get to be a leader of civilization. It is a long, deep game where every action matters, including those of your opponents. Weigh your choices carefully, and become the most advanced civilization; or languish in the shadow of greater leaders. What is Through the Ages like? A long tableau building game where you develop your civilization. All players start with the same tools at their disposal (action points, food production, resource production, science, culture, happiness and military) but it is up to each of them to pick their strategy. Developing new technologies or choosing leaders, however, is not a pre-planned strategy: one of the pillars of Through the Ages is card drafting, with different costs depending on the turn, and an ever shifting offering. Card drafting is hardly the only element, however. On your turn you have a limited amount of actions, dictated by your government, technologies and current leader. While all players start at equal footing, their choices will change how many actions they have available. You need to use these actions wisely: besides taking new cards, you need to increase available workers, and assign them to produce food and resources, or assign them to scientific or cultural buildings. You need food for workers, and you need resources to build new buildings or military units, but to get these advanced buildings and military units, you need workers on scientific buildings. Culture are essentially victory points, not to be forgotten, even though initially they might seem a bad investment. Cultural buildings generally generate happiness as well. Besides those new technologies, other cards to draft are action cards (which generally offer a discount on one of your usual options, like building or upgrading something), wonders that offer diverse bonuses and you should use to define your strategy, and leaders which can define your strategy even more. On top of all this balance you need to keep, there is a separate deck for military cards that also includes events. These events will happen eventually, and most of the time benefit the player with the best military, or punish the player with the weakest (ancient age events are the exception, most are positive and are meant to accelerate the start). Military victory is not possible, but having the strongest military will put you ahead of your opponents. Some of the events are colonization, which offer exciting benefits… at the expense of your military units. All in all, a deep, challenging experience where you have very detailed control of your choices, but it requires a good chunk of a day to complete. The theme is brilliantly translated into gameplay and the careful balance you need to strike between resource and food production (and consumption) and developing science and culture on top of that really makes you weigh every action carefully – not just for now, but for the remainder of the game. Events and military will put pressure on this balance, as well as game-changing leaders or influential wonders built by your opponents. The mechanics are really solid, but considering how heavy the game is, it is not too friendly for beginners. The manual does an excellent job at introducing the first turns, but it is a complex game. The worst drawback is the time spent on it, even for experienced players the 120+ minutes on the box is not lying, and I feel 180+ minutes would be more accurate. Time investment does not make it a worse game, but makes it attractive for a smaller audience. 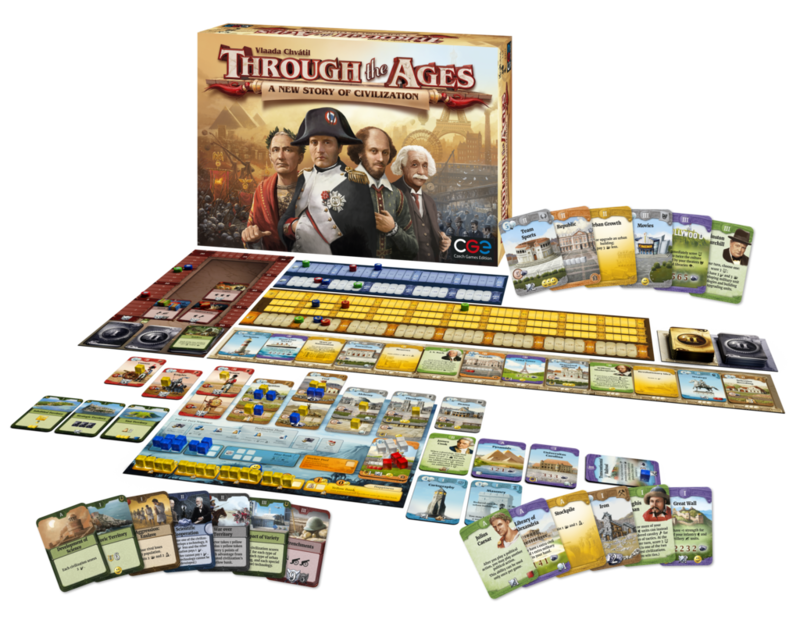 Through the Ages is decidedly fun, if you have the time to invest in a full game. The difference in enjoyment between veterans and beginners is more marked than in other games. It really feels as if though your civilization progresses through the ages, and production and consumption of resources needs to be carefully balanced. The illustrations on the cards are solid, good representations. I decided to lower the score because while the art is good, the representation for culture and science points and rating, and military strength, could have been simpler. Good quality overall. I should mention storing the cards on the original box is confusing, the dividers seem… randomly sized, but that is just nitpicking. It gets easier to learn the mechanics when taught by a veteran, but that is just the basics. The different approaches that can be taken, coupled with the random factor of the events and drafting make this a highly complex game. It does feel rewarding when you “get it”, but the many variables (events, military cards, draft,…) make every new game a challenge; which is good, but complex.